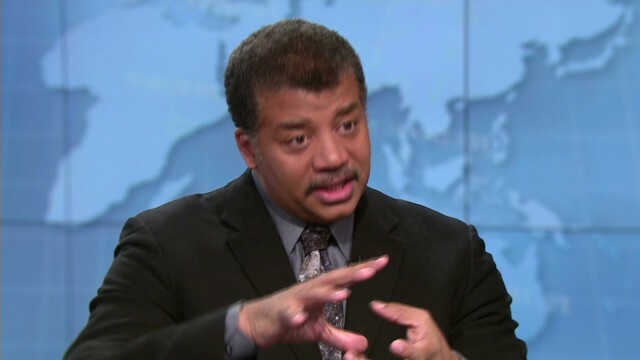 CNN’s FAREED ZAKARIA GPS features an interview with, astrophysicist Neil deGrasse Tyson. Tyson speaks to Fareed about why it’s important to study science and the origin of the universe. In addition, Tyson outlines NASA plans for further space missions even when earthly worries like Russia’s actions in Ukraine affect space cooperation. ZAKARIA: Three years and one month ago, the space shuttle Atlantis landed at Kennedy Space Center. UNIDENTIFIED MALE: Mission complete, Houston. ZAKARIA: And with those words, the space shuttle program ended, and with it America’s ability to get to space on its own. For now the U.S. is reliant on, guess who, Russia, to get its astronauts to the International Space Station, which might have sounded like a good idea until this. And this. Now U.S. and Russian relations have all but broken down, so what happens to our space program, our astronauts? Joining me now is one of my favorite guests, Neil deGrasse Tyson. He is of course an astrophysicist, the host of “Cosmos: A Space-Time Odyssey,” and the director of the Hayden Planetarium. Pleasure to have you on. NEIL DEGRASSE TYSON, DIRECTOR, HAYDEN PLANETARIUM: Thanks for having me back. More like a regular now. ZAKARIA: What does happen with our astronauts and that ability to do something routine and regular in space? TYSON: NASA is working on a sling shot. TYSON: I have no idea. One of the great challenges — there’s the great koombaya moment that we all feel when we say let’s all go into space together. And typically, when you conceive of such a plan, different countries and different organizations would be responsible for different links in the chain of getting from earth’s surface to wherever you will go. And on the surface, that sounds great. The costs are shared; it promotes international relations. But wisdom derived from human conduct tells us that this is not always a harmonious world, and politics can force you to behave in ways that maybe you don’t want to behave because you have other interests and other agendas. We want to go into space. And something is happening on the ground that’s somehow going to tell me who I can be friends with and who I can’t in space? That’s just embarrassing. ZAKARIA: And we don’t have the kind of funding in place to do this by ourselves by a long shot, right? TYSON: Well, no, not — well, I mean, there’s talk of getting private enterprise to serve our needs getting back and forth to station. ZAKARIA: What do you think of that idea? TYSON: I think it’s great. It should have been going on decades ago. ZAKARIA: But will it serve the research function? TYSON: So what you do is, if you have research needs, you would say, okay, the research funds will then get the access to space. So you rely on a private carrier, who can do it efficiently and effectively, and on time, and then you worry about the frontier. And that frontier doesn’t always have a capital market valuation. TYSON: And so governments take those first steps. TYSON: Anywhere in space. I can think of — look at the resources sitting there doing nothing, other than threatening us being — as colliders — on asteroids. Asteroids are nothing but natural resources. There’s a set of elements on earth that we call rare earth elements. They’re called that because they’re rare on earth. TYSON: Yes, there are places where you can hand-pick some asteroids where this stuff is quite common. I can see a business case, ultimately, to withdraw minerals and resources from asteroids and use it for other space-based needs as you expand your frontier, but somebody has got to do it first. And that’s typically expensive, and you don’t know what the return will be, so government investments are typically how that goes. ZAKARIA: What is the Orion spacecraft that NASA is talking about building? TYSON: Right. All these efforts are trying to get us back into space on the — on the — with the goal of possibly sending humans to the Mars system, Mars and the moons and the like. And if you have that capacity, then you have the capacity to go many other places. You could visit comets, you could go to the moon easily once you’ve configured that. So these are the things that have been discussed, but I don’t see it happening in a real tangible way. In the 1960s, we were going to the moon, and every couple of months you saw the next spacecraft ready on the launch pad. You led off with the ending of the shuttle program. For many people that was sad, and it should not have been sad, because had the cards been played right, on the next launch pad would have been the next vehicle to continue this adventure in space. And you say, okay, it served us well, mothball it, but here’s what’s next. No one was sad at the end of the Mercury program because the Gemini rockets were ready right there on the launch pad. And no one was sad when Gemini ended because the mighty Saturn 5 was ready to go. ZAKARIA: But we’ve fallen out of love with space in that sense? TYSON: Perhaps. I think it’s because the — when you stop moving a frontier, you forget what’s on the other side of that frontier that could titillate explorers, the explorer gene built within us. But on top of that, that can actually transform how we live and what we know of the physical world. And it’s the fact that we have explored since we’ve left the cave that has enabled civilization to be what it is. The people talking on their cell phone and following GPS instructions to where grandma’s house is saying I don’t need space — excuse me, that’s how you know where grandma lives, and when to make the left turn. There’s DirecTV, there is satellite radio, there’s all these things that involve space, and you’re going to say now that we don’t need anymore space? There’s nothing else I need? ZAKARIA: Since I have you, I have to ask you. You were recently on the cover of the National Review. TYSON: Was that me or is that a caricature of me? I don’t know — the National Review, founded by William Buckley. TYSON: Yes. I mean, if there’s a higher intelligent species out there, we would surely look like dribbling fools in their presence. And it’s an easy way to come to this conclusion. What is the next, quote, intelligent species after humans? Maybe the chimp? We have 99 percent DNA in common with the chimp. But what does the most brilliant chimp do? It can stack boxes and reach for a banana, maybe some rudimentary sign language, and maybe do some finger painting, like our toddlers can do. Our toddlers do what the smartest chimps can do. So I said, well, suppose there’s another species 1 percent beyond us in the intelligence scale, just as we are beyond the chimp. How smart would they be relative to us? And I joke about this. They would roll Stephen Hawking forward, and say this one is slightly more smarter than the rest, because he can do astrophysics calculations in his head. Like little Timmy over here who just came back from middle school, in their alien — in their alien school system. So it was a very real comment on our species. Not on — the — the article in the profile with me on the cover of National Review. But the author wanted to believe that I made that comment referencing some other people, and somehow I wouldn’t be included in that. I’m so included in it. Everybody is included in it. Stephen Hawking is in it. But he had to say it because he had an agenda — an article agenda that he had to fulfill. ZAKARIA: Pleasure having you on, Neil, as always.